We recently crowned this year's Motorola handsets as the best value-for-money brand-name phones you can buy in the US, and for a good reason. The Moto X Play and Moto X Style, as well as the Moto G 2015, are some of the best-priced handsets in their respective categories, and each of them offers a little something above the fray to stand out, too. What does Motorola have in store for us next year, though, when Lenovo would have arguably folded its phone business into the brand for the most part? 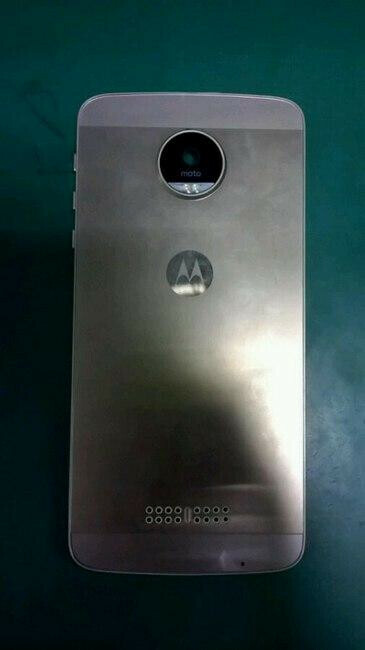 Well, a piece of the answer may be this leaked prototype of the eventual Moto X 4th gen which emerged on Chinese social media with the tipster warning that this is still an engineering testbed, and the finalized device might look different. With this disclaimer out of the way, the source states that this purported Moto X 2016 is built into a metal chassis, which would be par for the course now that most phone makers and their dogs have moved to more premium materials for their handsets' exterior. There is also a huge round camera unit area on the back, perhaps signifying that Motorola might step up its efforts in the mobile photography department that has never been its strongest suit. As if to further suggest a more multimedia-centric nature of the next Moto X, the prototype pictured here has a giant set of what we'd assume are speaker grill holes below the etched Motorola logo on the rear. Other than those new elements that Motorola is apparently experimenting with, the phone keeps the general corner form of the current Moto X generation, yet clad in a metal dress, and seemingly a bit thinner than what we have now, what do you think? Jesus Christ that camera. You know the sensor is gonna be HUGE, at least 1/2" at a size like that. So NO fingerprint scanner this time too??? Can't tell, the new Qualcomm scanner works with ultrasonar waves. It works with metal, glass etc. They might finally be able to put the scanner in the logo on the back. I hope they keep the front stereo speakers! I just remember the time when people call nexus 6p ugly in the leaks and after launch they just love the new design. But why a rear firing speaker?? Clearly an attentive design, I like it but the speaker makes it look like a budget phone. I will not be interested in this device if it does not have front facing speakers and is over 5.5"
Removing the front facing speakers would be the biggest mistake they would ever make. That's one of the things that really separates the phone. Plus all metal build should be an option otherwise the customization is seriously limited. These are pretty horrible decisions if this ends up being the final product. As a phone in general it looks nice and a great camera would be nice, but as a Moto X, this would be extremely disappointing. If step away from their current design I'll be passing this one up. This is probably not real so it doesn't even matter. If it does end up being this then I hope the Moto X Pure edition is gonna be cheaper. Looks good. Who knows, maybe it'll have both front and back speakers which I think would be a first. Whatever they do, I hope they have an option with a reasonable screen size (~5") and make it available in Canada. I've wanted both the Turbo and Turbo 2, but neither are available here through Motorola. I certainly hope this is fake. Otherwise I'm done with Motorola. I was frustrated when they went to 5.2" (when 5" was plenty for most people), then they made it a phablet and ruined the display, and they they've made it blocky. Everything the Moto X was built upon is now completely gone. Not function before form, not bucking the phablet trend, just more of a same bland crap. Might as well buy a Samsung next time.